1/10/12 - Acquisitions - Le-Puy-en-Velay, Musée Crozatier and Bordeaux, Musée d’Aquitaine - If the auction of the furnishings in the château de Varvasse has been widely covered in the media these past few days it is mainly due to the name of the owner, that is the former president of France, Valéry Giscard d’Estaing. 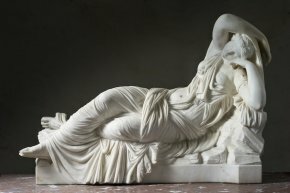 Art lovers did not find any really important objects there, with of course a few exceptions, including a marble signed and dated by Pierre Julien, copying the famous Ariane Sleeping held at the Vatican. We all know that this antique has inspired artists, both painters and sculptors, since the Renaissance. The work, slightly worn due to exposure, probably outdoors, was pre-empted by the Musée Crozatier in Puy-en-Velay for 82,000€ (without charges). This does not come as a surprise since Pierre Julien was born in the Puy diocese, in the village of Saint-Paulien and the Musée Crozatier which already owns several of his works, had staged an exhibition on the artist in 2004, which we had reviewed here (in French). In that retrospective, there was another replica of this Ariane, held at Versailles, but with an unknown provenance and the attribution to Julien was simply traditional. The one just acquired is however signed and dated 1785. It was produced in Paris and, according to the exhibition catalogue : "the treatment of the folds is much less detailed than in the original, showing a recourse to a simplified version, modeled copy or bronze rather than a cast or direct copy." Another pre-emption (for 6,000€ before charges) also occurred at this same auction, by the Musée d’Aquitaine in Bordeaux. 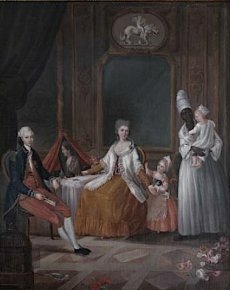 This time it concerns a painting representing a Family Portrait, given to the circle of Augustin Brunias, also known as Agostino Brunias, a painter active partly in the West Indies and one of whose canvases was recently acquired by the Brooklyn Museum (see news item of 11/8/11. While there is no sure proof that this is a family from Bordeaux, the museum acquired it for two reasons . First of all, since the Châtillon bequest in 2000, it already holds several works by Brunias ; also, the representatons of black servants in the 18th century are rare. These were usually seen in coastal cities involved in the slave trade. The painting will thus fit in naturally in the permanent rooms which were refurbished in 2009 and present "Bordeaux in the 18th century, Atlantic commerce and slavery." We would like to thank François Huber, director of the Musée d’Aquitaine, for this information.